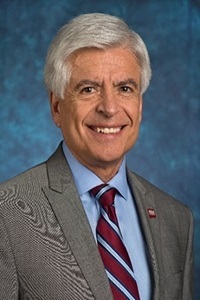 Dr. Dan Arvizu became Chancellor and the 28th Chief Executive of the New Mexico State University System (NMSU) on June 1, 2018. NMSU is New Mexico’s land-grant institution founded in 1888 and is presently one of the nation’s foremost Hispanic-serving universities. NMSU is a NASA Space Grant College and is home to the very first Honors College in New Mexico. Dr. Arvizu is the second alumnus and first Hispanic to be hired as the NMSU System Chancellor and Chief Executive. He previously served in various roles at Emerson Collective including Chief Technology Officer and STEM Evangelist, and presently serves as Senior Advisor. He also serves as a Venture Partner for Sustainability for Ridge-Lane Partners, Ltd. and as a Precourt Institute Energy Scholar at Stanford University. Dr. Arvizu has had a long distinguished career in advanced energy research and development, materials and process sciences, and technology commercialization. He started his career in 1973 at Bell Labs, and after four years transferred to Sandia National Labs, where he spent the next 21 years, 14 years in executive roles. In 1998 he joined CH2M Hill Companies, Ltd for 6 years, his last two years as a CTO. In January of 2005 he was appointed the 8th Director of the U.S. Department of Energy’s National Renewable Energy Laboratory (NREL) in Golden, Colorado and became the first Hispanic Lab Director in the history of any of the 17 U.S. DOE’s National Labs. He retired in December of 2015, and is presently Director Emeritus. Dr. Arvizu serves on a number of boards, panels and advisory committees including the State Farm Mutual Insurance Board of Directors, the Singapore International Advisory Panel on Energy, and the Stanford Precourt Institute for Energy Advisory Council. In 2004 he was appointed by President George W. Bush, and subsequently in 2010 reappointed by President Barack Obama (twice confirmed by the full Senate), to serve six-year terms on the National Science Board (NSB), the governing body of the $7.5 billion National Science Foundation. He was twice elected NSB Chairman by his peers and served in that role for four years (2012-2016) where he testified annually on NSF’s budget before Congress. He was the first Hispanic Chair of the National Science Board, founded in 1950. He is an elected Fellow of the National Academy of Engineering and the National Academy of Public Administration and in 2016 received the Secretary of Energy’s Exceptional Service Award for more than three decades of energy contributions. He has received numerous awards and recognitions including induction as a member of the U.S. News and World Report STEM Leadership Hall of Fame, induction as a member of the Great Minds in STEM Hispanic Science and Engineering Hall of Fame, and in 2010 was awarded the Hispanic Scientist of the Year, by the Museum of Science and Industry, Tampa, Florida. Dr. Arvizu has a Bachelor of Science in Mechanical Engineering from New Mexico State University, and a Master of Science and Ph.D. in Mechanical Engineering from Stanford University.